We’re a local family-owned & operated Washburn, ND floral business ~ Providing prompt and courteous service and specializing in fresh, high-quality and creative floral arrangements. With over 30 years combined experience, our friendly and knowledgeable staff takes pride in adding that special little touch - a butterfly, bird, special card – to make your design uniquely yours! We have expanded our services to include a Coffee Bar with drive-up window, more unique gift lines and an online floral service. We hope you enjoy your online shopping experience with secure 24-hour ordering right at your fingertips. If preferred, you may call us to place orders direct at (701) 462-8600. It is our pleasure to assist you with any local, as well as worldwide deliveries and remember that corporate accounts are always welcome. 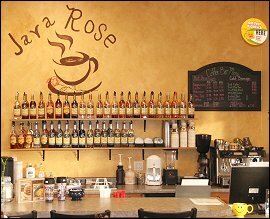 JAVA ROSE FLORAL & CAPPUCCINO serves Washburn, Turtle Lake, Wilton & Center, as well as the local power plants. Our shop is open to serve your floral and gift giving needs: 9:00 am to 5:00 pm Monday – Friday and 9:00 am to 2:00 pm Saturday. Closed Sunday. For your convenience, we offer daily floral delivery to local funeral homes and hospitals. WEDDING AND SPECIAL EVENT FLOWERS ~ Let Java Rose Floral add the beauty of flowers at your dream wedding, corporate functions, parties or other special events - large or small. Call to schedule a consultation, so we can help you start planning your next occasion! WHEN IT'S TIME TO SEND FLOWERS TO A FUNERAL ~ You can depend on us to design and deliver an arrangement that beautifully conveys your expression of sympathy and serves as a lovely memorial to the deceased. Thank you for visiting our website with flowers delivered fresh from your local Washburn, ND flower shop, Java Rose Floral & Cappuccino!